The Puketi Forest is an ancient kauri (Agathis australis) forest located in the heart of New Zealand's North Island. Along with the Omahuta Forest, it forms one of the largets contiguous tracts of native forest in the Northland. Home to Te Tangi o te Tui Puketi, the fourth largest living kauri with a height 50.9 m (167'), Puketi is easily accessible from the Bay of Islands and Hokianga Harbour. 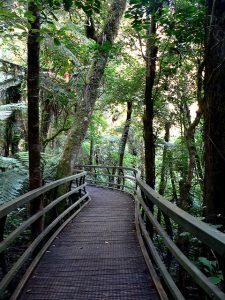 The Puketi Forest offers a diverse range of walking and tramping opportunities. Puketi Forest was once a marvelous ecosystem that supported thousands of native birds. The Puketi Forest Trust is working to restore this unique rainforest to its original biodiversity. To find out more, or to help sponsor the forest, please visit their website - www.puketi.org.nz.